Are you getting confused with right and left sides when wearing slippers or shoes? Do you frequently spill a cup during meals? Although you may experience these situations inadvertently, sometimes, it may be a cause of a much bigger problem or a sign of some serious disease if they happen often. It is estimated that over 60 million people are suffering from glaucoma across the world. In fact, it is the second-leading cause of blindness after cataracts. But more surprisingly, about 90% of people with glaucoma do not know that they have the condition. Yes, it is an eye disease that has almost no symptoms. Not being able to travel, and quitting job are some of the common consequences of glaucoma. Furthermore, driving a car can be very dangerous for people with glaucoma. In the worst case, glaucoma can cause an increased risk of blindness. In this article, we'll tell you the latest information about glaucoma, why it causes accidents or mishaps, and why you can be unaware that you have this condition. We'll also tell you how you can help prevent glaucoma or stop it from worsening. A Dangerous Eye Disease that Causes Accidents and Mishaps! In layman's term, glaucoma is a disease of the eye that impairs vision because of damage in the optic nerve. It causes gradual loss of sight, sometimes leading to blindness. Accidentally bumping into people very often. Spills a cup during meals. Skipping lines of sentences when reading books or texts. Having difficulties in finding small objects (like medicines) that are dropped accidentally. Diagnostic tests show that most people with glaucoma experiencing the above similar situations already have lost nearly half of their field of vision. Most importantly, they don't seem to notice that their field of vision is missing. How can this happen? Glaucoma Vision Problems Are Not Very Apparent! For you to understand how glaucoma affects our eyes, you'll first have to know how our eyes work. When we see things, the information is received by the retina, which is a layer located at the back of our eyeballs, and forms an image. The image information is now carried to the brain through the optic nerves. In glaucoma, the retina is functioning normally but the optic nerves are damaged and will cause vision loss. Pressure is being constantly applied to the retina (intraocular pressure [IOP]), but for some reason, the eye pressure becomes stronger and damages the optic nerves. Below is a picture that shows how the image information is being transmitted to the brain with damaged optic nerves of a glaucoma patient. The dark areas are the blind spots. If you look at the picture above, glaucoma seems to be very noticeable. Yet, why is it that a glaucoma patient can't notice this? 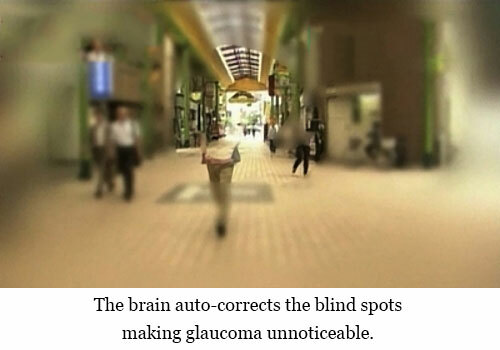 Latest studies show that on a glaucoma patient, rather than seeing blind spots, these visual defects are being filled-in by the brain based on the information received from the surrounding retina. This will result to what appears to be a corrected image. 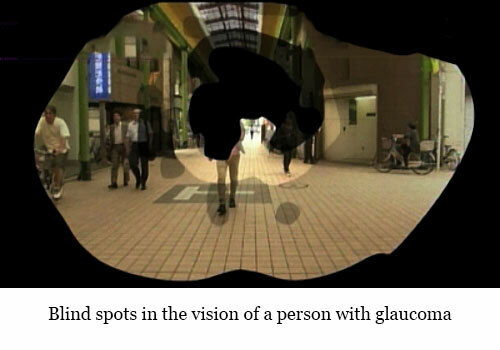 Now based on the previous picture that shows blind spots, let's take again a closer look on what you will see in real time if you have glaucoma. On the image below, a man at the front is walking towards you and enters your field of vision. However, the figure of the man seems to partly disappear. This shows that the brain is correcting the image based on the visible landscape. Because the brain is correcting or filling-in the blind spots, glaucoma is truly difficult to detect. Once you have glaucoma, you can no longer reverse it due to the extent of damage incurred. However, if treatment is done early, it is possible to stop the progression of the disease. There are available surgeries for glaucoma but they are painful and these operations are only temporary solutions. Since the majority of glaucoma cases are caused by increased intraocular pressure, you can actually lower it using eye drops. The eyes are naturally moist, and fluid is continuously produced to help circulate important nutrients to many parts of the eyes. With glaucoma, the eye pressure goes up because of increased accumulation of fluid. This often causes damage to the optic nerves. 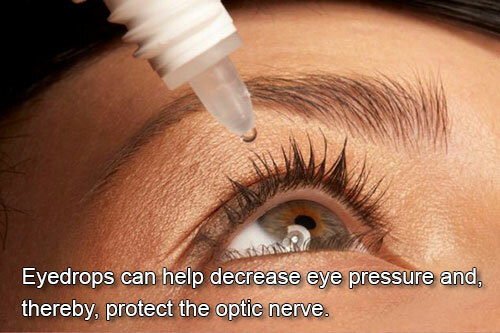 The use of eye drops can be effective in reducing damage to the optic nerves as it has the effect of adjusting the amount of fluid in the eyes. This can greatly make the lives of glaucoma patients a lot easier. Because of the advances in medical care, the incidence of blindness due to glaucoma can be lessened. It's also worth noting that patients with myopia are at a higher risk of having glaucoma. We recommend that eye examination is performed once every five years in people age 40 and above. 1. Control you blood sugar level. A high sugar intake is also linked to elevated blood pressure levels. This is especially true to people with diabetes and to those who are obese, thereby causing high eye pressure. Avoid excessive consumption of sugar, breads, rice, potatoes, cereals, grains, and pasta. 2. Do aerobic exercise. Studies show that intra-ocular pressure can be lowered through aerobic exercise. You can do a 20-minute brisk walking for at least four times a week. Medically, the cause of glaucoma is unknown, but not in other alternative healing modalities. Read "How the PYRO-ENERGEN electrostatic therapy machine works". Just like cancer and viral diseases, glaucoma is caused by an outside negative energy force surrounding a patient's body. By eliminating the negative energy, glaucoma, or the unusually high eye pressure cannot occur and so many other diseases for that matter. The PYRO-ENERGEN is very effective in eradicating the negative energy, thereby preventing glaucoma or preventing the condition from worsening on a glaucoma patient. IMPORTANT: The PYRO-ENERGEN cannot completely cure glaucoma if vision loss due to the condition has already occurred even through the root cause is eliminated. This is because a damaged optic nerve is irreversible and physically, it doesn't have the capacity to regenerate. Early detection is very important and we advise that the PYRO-ENERGEN therapy is done is early as possible. Also, to prevent recurrence after a glaucoma eye surgery, PYRO-ENERGEN is highly recommended. 2. "Sudden Blindness (A New Strain of Maladies)"